Don't think of this as just a healthy version of fish and chips. It's a delicious dish in its own right. The secret is the avocado yoghurt; it works perfectly with both the fish and the sweet potato chips. Try it once and next time you might find yourself craving this instead of the battered version. 1. For the avocado yoghurt, combine all the ingredients in a bowl and blend with a stick blender to a smooth puree. Season with salt, stir through the chives and set aside. 2. Heat your oven to 180C fan-forced. With a vegetable peeler or mandolin, peel the sweet potatoes lengthways into long, thin strips. Place some baking paper in a large oven tray and brush the paper with a little olive oil. Lay the potatoes in a single layer on the paper and brush with more oil. Bake in the oven for eight to 10 minutes, removing the chips as they turn brown. Season with salt and set aside uncovered for a few minutes to crisp. 3. Heat a frypan with a heat-proof handle over high heat. Brush the fish with the remaining oil and fry for three minutes on one side (cooking time will depend on the thickness of the fillets). Turn the fish over and transfer the pan to the oven for three minutes to cook through. Remove from the oven and rest the fish for a few minutes before serving. 4. 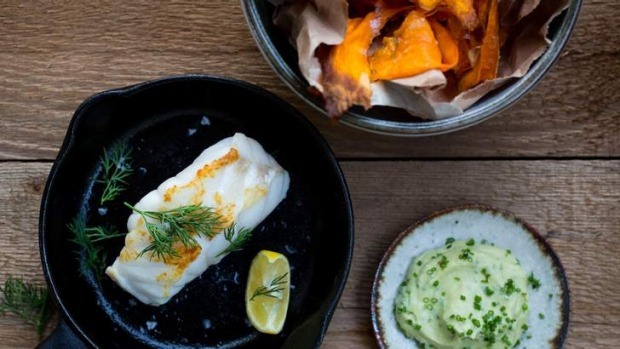 Scatter the fish with dill springs, and serve with the sweet potato chips, avocado yoghurt and lemon wedges.